CZ P10C Striker Rotation and out of battery fix. Hello, I have made a after market part to replace the polymer striker carrier housing on the P10C anyone interested. Need to have it Beta tested. Re: CZ P10C Striker Rotation and out of battery fix. I'd be interested in testing in a P-10F when it arrives. I won't be shooting a P-10C enough after the P-10F arrives to be of much use to you, and I should put maybe a 1000 rounds through the new P-10F before I will be changing anything in it, just to make sure it is a good candidate for a bullseye gun. So I am not your guy for maybe two months. After that, sure, assuming I haven't gone back to a P-09 full time. I like what you have done here, but I'm not the guy to give an expert opinion on the mechanical design changes you have made. Looks good to me. I have a hammer and a file, and several packets of Sugru, nothing much more sophisticated than that. I do have an experienced trigger finger and lots of cameras. That looks to be an original P-10C, before the updated striker with the anti rotation slot and flange. Still several originals out there that might be able to use an updated part. I haven't looked at the new one yet, just external images, if all that is changed is a added slot and a extension to ride in it, I personally would still put this in the new version also. and the fix of just putting a longer pin in and drilling a hole in the back plate doesn't fix all these combined errors. It just ties 2 loose parts together, into 1. I have an original P10C and I shoot a lot. IDPA and outlaw steel matches. I don’t have any issues with my P10C since I beveled the striker plate. I don’t know how I could improve on 100% reliability. I haven't heard of very many people having this issue, and they were all the first gen, not the new ones. The new one is on the right, and the new NEW ones are being built in the US, don't know if they made more changes. As is, I have several thousand rounds through my FDE, original, with no problem. Have you had many approach you about this type of fix? I have not had anyone approach me with issues, I saw the posts and the videos online of the "rotating striker" and disassembled my P10C with less than 200 rounds through it, and did not of course like the flaws/tolerances (which has been addressed in the new models)but did not like the polymer piece and its overly loose tolerances, upon questioning if the tolerances were too loose or correct compared to other firearms, I disassembled 3 Glocks a 25 year old up to a year old model, and they all have far tighter parts and tolerances. In the video as with my opinion the design is slightly flawed, and this newer part negates those flaws. If people wanted, I am a Mechanical Engineer, working in the field as a Polymer Injection Mold Engineer and head CNC machinist, that is where I get my opinions on that part in specific. I could make a new injection mold that fit better. As it stands I could not trust my life to this firearm as it is. It looks like you did some excellent machining. I got rid of my two black P10C's that were the older model. My FDE version has the newer groove. I never had any issue with the striker rotating when shooting. You go to great lengths showing how the show how the plastic rotates. Can you show that movement with slide on the frame? I don't see how you could get that much rotation with the pistol together. I went to the range and tested this Aluminum part, uncoated, 250 rounds, it worked flawlessly, checked, drop safety, and it worked as well. I also was allowed to take the slide off of a brand new P10C with the new slot cut in the slide mod from the factory. 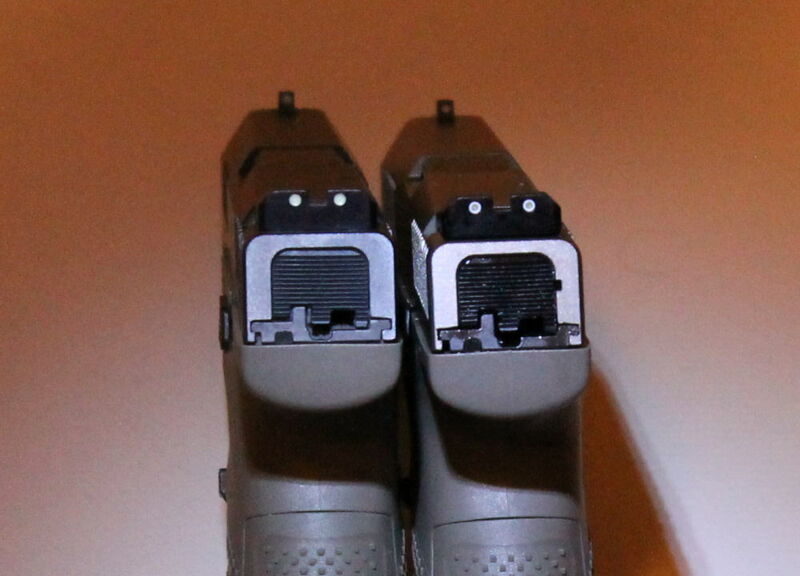 Aluminum is not a good wear material, it is soft and gummy, and can gall easily, but there are a lot of non polymer pistols that use Anodized Aluminum (Al 6061 no less) as the lower frame material and the slide rides on the aluminum rails, example, a KRISS Sphinx, or a Beretta. That is why I am trying 7075 its the strongest and hardest Aluminum, and with Nickle Boron Nitride the coating should last longer than Hard Anodize, and has a lower coefficient for friction. Even though I have had no issues with the firearm working, it is prematurely wearing, the drop safety doesn't work, even in the newer slide cut model. And the parts are showing wear marks from the parts slopping around all over. I might Also try to machine a Delrin part the same as my Aluminum part, but I think the polymer piece is too flimsy. But I do like the no lubricant needed idea. The polymer in the lower is a glass filled Nylon, I could use that also but Nylon is hydroscopic (absorbs liquid) and swells, and also becomes brittle, Delrin does not, and tensil and impact are close, chemical resistance is high. probably what the factory piece is made from. If I jump to machining a Delrin piece and it works, I will make a new injection mold, and we can replace the factory part for either version for a upgraded part. Great idea. I am in for 2 if the price is right. Also, I recommend an aluminum backplate as well. Like you, I've not had a problem with rotation but why not. Keep us posted. I'd beta test if you need.